Rarely does the perfect job in the perfect location just fall into the laps of newly minted college graduates. And, for tomorrow’s business leaders, a stellar GPA is not enough. Leadership, communication and negotiating skills, problem solving abilities, and teamwork are equally, if not more important. A freshman survey conducted by the Higher Education Research Institute showed more than 86 percent of college freshmen attend college to get a better job. The Carson Center for Student Success is focused on empowering students to meet this goal. In spring 2016, the center surveyed Carson capstone students across WSU locations shortly before graduation and found a total job placement rate of 56 percent. Of the jobs taken, 87 percent were full-time. The survey also measured potential drivers of success for students with full-time jobs versus students who were still looking. Results revealed that for students with full-time jobs, the top three drivers of success were work experience during school, attending career networking nights, and career workshops—résumé writing, in particular. From left, Shannon Flynn, Chip Hunter, and Tom Tripp leading the job negotiation workshop. The center is using this data to shape professional development programming. In spring semester 2017, the center hosted a new job negotiation workshop presented by panelists Chip Hunter, dean; Tom Tripp, associate dean for academic programs; and alumna Shannon Flynn, Microsoft senior human resources manager. Students were divided into two role playing scenarios. One group acted as “Pat,” a company product manager tasked with hiring a product manager trainee. Pat has a fairly limited package to offer but could extend a signing bonus, moving expenses, and several thousand dollars above the typical starting salary. The second group acted as the job candidate—“Taylor,” a Carson College undergraduate about to graduate with a great GPA and internship experience. He already completed two successful interviews with Pat and has been asked back for a third meeting. Taylor is thrilled at the prospect of working for this company located close to where his significant other lives and is counting on a job offer at the meeting. Students had just 10 minutes to review their respective scenarios before launching into the role playing exercise. At first, they viewed the situation as an uncomplicated matchup, but soon learned how difficult it can be to quickly negotiate a start date, moving expenses, signing bonus, salary, benefits, and perhaps even an early performance review. The panelists also spoke about how employers will use different tactics to arrive at a sweet spot within the zone of agreement, such as “log rolling.” Tripp explained log rolling occurs when a recruiter offers a candidate a tradeoff—for example, a required start date in exchange for more salary. Flynn advised students to prepare by being able to clearly state their purpose for negotiating. Flynn also recommended students consider what a company can do for them long-term versus just at the time of the offer. “Look at the whole package beyond year one, and find a company that fits your values,” she said. Students received other key tips during the workshop, such as how having an arrogant or demanding attitude can be a deal breaker. “Speak generally about your needs and avoid salary discussion at first,” Tripp advised. Hunter suggested students tap into the Cougar network to get information about potential companies and to talk with peer graduates or other sources about what to expect during negotiations. 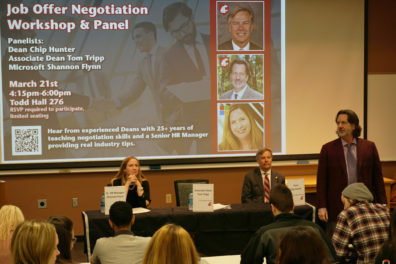 Beyond the job negotiation workshop, other efforts to prepare students include a management negotiation course offered at WSU Pullman, Vancouver, and Tri-Cities locations. “This course includes role playing all semester long to help students develop the job negotiation skills they will need to be successful,” said Tripp.